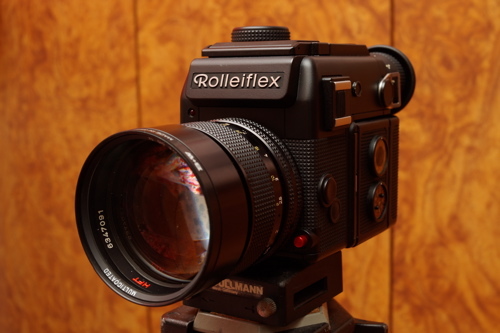 The last lap of Rolleiflex 35mm SLR cameras came the SL 2000 F. The launching of the body was not without trouble and the first production model was launched quite a while after the display of the prototype in the Photokina. To me the SL 2000 F was daring and ahead of time. Never before you will get a 35mm body with electronic shutter, build in winder, build in vertical finder and interchangeable magazine. 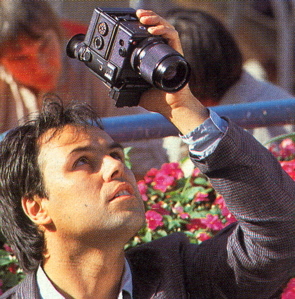 And if you look carefully the overall package was much smaller than a Nikon F-3 with winder or a Canon F-1 with winder. 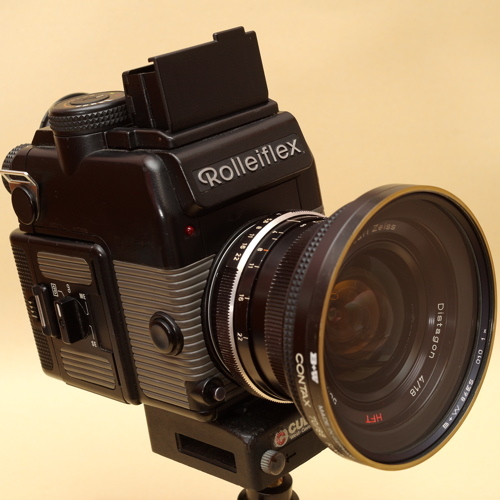 Really daring for Rollei to launch this product. 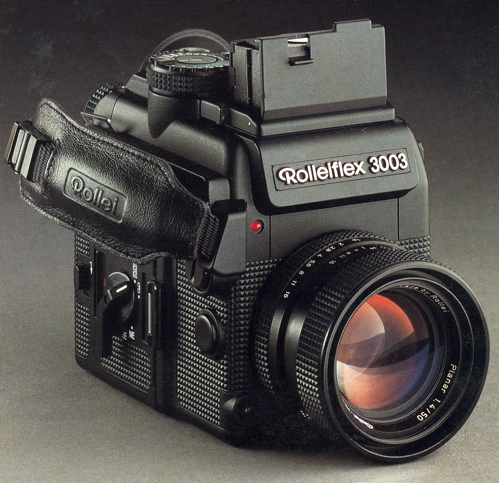 Unfortunately again Rollei did not really make it big with this model and the last of the series the 3003. 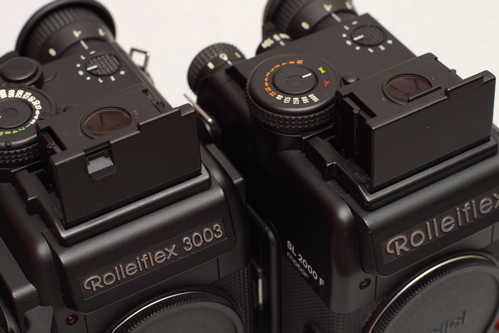 Finally the 3003 stopped production and Rollei left the 35mm SLR market totally. 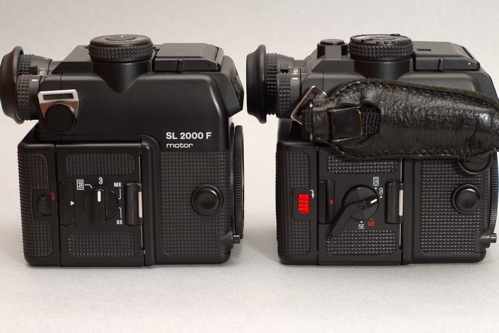 Left to right: Battery pack, film insert, film magazine housing and the SL 2000 F Body. i. Slightly different external appearance. 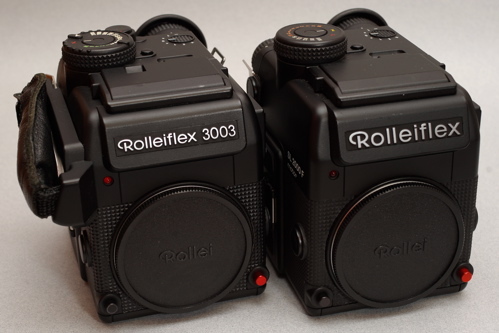 The model name in front was ‘Rolleiflex 3003’ instead of the very nice and big ‘Rolleiflex’ on the SL 2000 F.
ii. 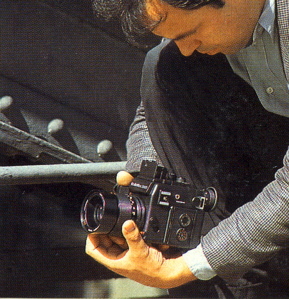 A video camera type of handgrip was installed on the right hand side with an additional release button added on top and improve magazine ergonomics. iii. Top shutter speed was 1/2000 instead of the 1/1000 in SL 2000 F.
iv. 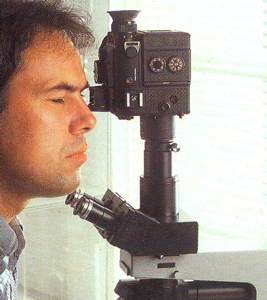 Improved ergonomics of the vertical finder. v. Flash indication in viewfinder as flash symbol instead of a red dot. I did heard about some reliability problems with the SL 2000 F and 3003. 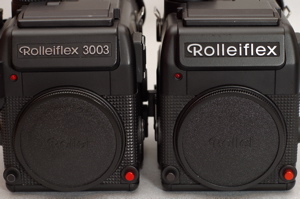 However my personal SL 2000 F and 3003 had been very reliable. The only problem I encountered was occasional magazine jammed. However I am not a professional photographer so my usage might not be too severe enough to push my SL2000F/3003 to their limits. The camera body design took me about two weeks to get use to. 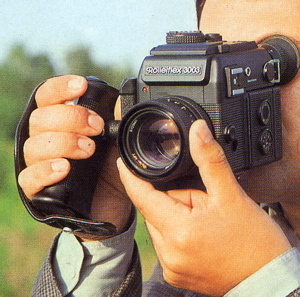 My only other complaint on the SL 2000 F/3003 was the edge of the viewfinder could not be easily used for focusing even when matt screen was used. 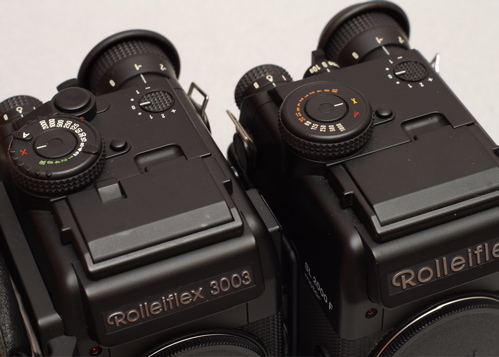 Metering system used on the SL2000F/3003 was quite different from the rest of the Rolleiflex SLR models.Whereas the rest were using centre average metering, the SL2000F/3003 were using a unique metering system. 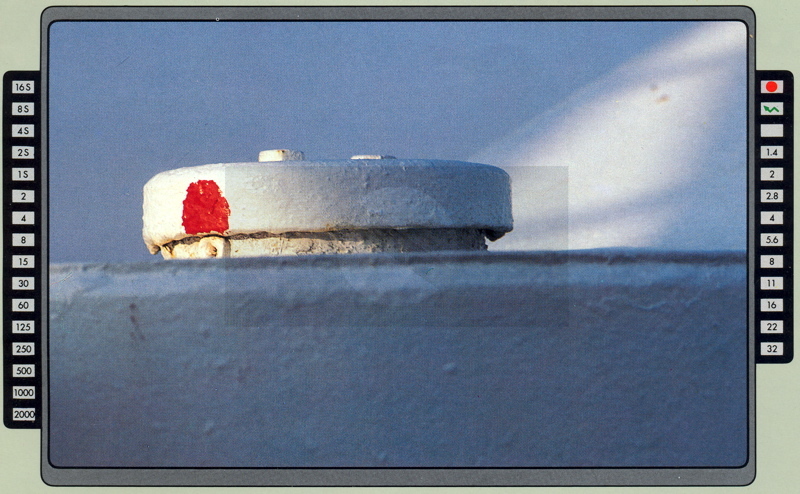 The metering area was a rectangular area, slightly darken in the centre of the view finder (see diagram below). Therefore the metering pattern was between the more general centre average metering method and the slower spot metering method. Metering methods available were the aperture priority metering and full manual metering with user selected shutter speed and aperture. There were provision for meter reading lock and EV adjustments. There was no provision for mirror lock-up. Mechanical release was not available for these bodies. So you would need to use the expensive electronic cable release. 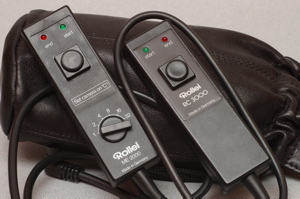 The RC3000 is more convenient to use for most purposes. The ME2000 model has number of frame selections of 1, 2, 4, 8, 16 and 32. 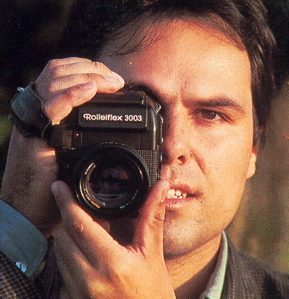 That is for you to take continuous shots with one squeeze of the release. However using B mode with ME2000 is tricky. What I do is to set the camera in B mode (normally the body is set to C mode with ME2000), select 2 frames on the ME2000. 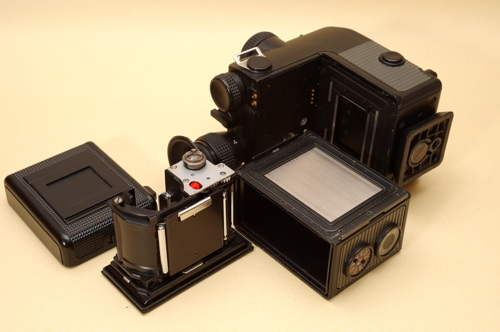 When you squeeze the ME2000, the camera mirror will lock up, to release the mirror to complete the exposure, just turn the frame selection switch on the ME2000 from 2 to 1. 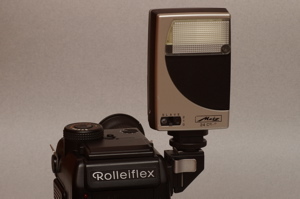 If you were not using Metz flash with Rollei SCA 356 shoe you will also need a right angle flash adapter. 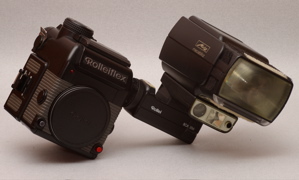 The right angle adaptor has 3 pins thus TTL to the body is poassible but so far other than the Rollei flash I have not seen any manufacturer produced flash that was able to flash TTL with the body. 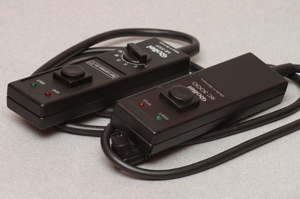 The SL 2000 F / 3003 used 5 AA batteries. Interestingly 5 NiCd rechargeable batteries would work better than alkaline ones. On some bodies the shutter might get jammed when alkaline batteries were used. Some however had no problem. I had been using modern NiMH batteries with my SL 2000 F and 3003 and had found no problems so far. 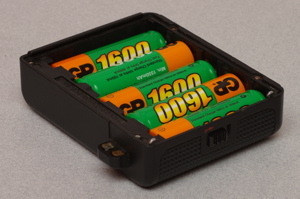 The SL 2000 F was supplied with empty battery housing that would accept 5 batteries. Later this convenient battery pack was discontinued and only integrated type of NiCd battery pack was supplied. The integrated type though convenient to use, but you will need to find some electricians to get the batteries replaced once they were faulty. 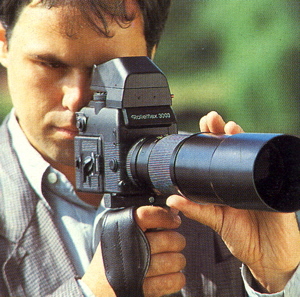 In terms of handling I felt that 3003 is the best with the video handgrip. With the handgrip the body is easier to take photo in portrait mode. Otherwise I found it a bit difficult and awkward using the SL2000F in portrait mode. 3001 was a simpler version of the 3003. Essentially the body only came with the top release button. 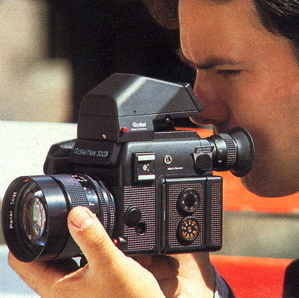 The 2 side release buttons were removed, as well as the vertical finder.